The class II trans-activator (CIITA), which acts as a master regulator for expression of MHC class II genes, is expressed constitutively in mature B cells. This constitutive expression of CIITA is driven by CIITA promoter III (CIITA-PIII). However, little is known about the factors that control the B cell-mediated trans-activation of CIITA-PIII. In this study using B cells we have identified several cAMP-responsive elements (CREs) in the proximal promoter and in the 5′-untranslated region (5′-UTR) that are involved in the activation of CIITA-PIII. We show that activating transcription factor (ATF)/CRE binding protein (CREB) factors bind to the CREs in vitro and in vivo. Notably, our results also reveal that the 5′-UTR of CIITA-PIII functions as an important regulatory region in B lymphocytes. Furthermore, transient cotransfections of a CIITA-PIII luciferase reporter construct with either CREB-1 or ATF-1 boost CIITA-PIII trans-activation in a dose-dependent manner, which was further enhanced by addition of general coactivator CREB-binding protein. Transient transfections using mutant CIITA-PIII luciferase reporter constructs that either lack the (5′-UTR) or abolish binding of CREB-1 and ATF-1 to the CRE located in activation response element-2, displayed severely reduced promoter activity in B cells. A similar successive deletion of the CREs resulted in a subsequent reduction of CREB-1-induced activity of CIITA-PIII in B cells. Together our results argue for an important role of ATF/CREB factors and the 5′-UTR of CIITA-PIII in the trans-activation of CIITA-PIII in B cells. Major histocompatibility complex class II Ags are cell surface molecules that play a pivotal role in the initiation of the immune response by virtue of their ability to present antigenic peptides to the TCR on CD4+ T lymphocytes (1, 2). Constitutive expression of MHC class II genes is tightly regulated and restricted to specific cell types, including thymic epithelial cells and APCs such as dendritic cells, B lymphocytes, and macrophages. Expression of MHC class II molecules can also be induced in other cell types, such as T lymphocytes after activation and fibroblasts and endothelial cells by treatment with IFN-γ (3, 4). The class II trans-activator (CIITA)3 acts as a master regulator of MHC class II and accessory genes expression, whereas it has an ancillary role in MHC class I expression (5, 6, 7, 8, 9, 10, 11, 12, 13, 14). It exerts its function in trans-activation through protein/protein interactions with components of the multiprotein complex comprising regulatory factor X (RFX), activating transcription factor (ATF)/cAMP-responsive element (CRE) binding protein (CREB) and NF-Y bound to the SXY regulatory module present in all MHC class II and class I promoter regions (15, 16, 17, 18). The constitutive expression of MHC class II molecules in APCs is congruent with the constitutive expression of CIITA. Similarly, induction of MHC class II molecules upon IFN-γ treatment coincides with induction of CIITA in cells that otherwise lack expression of MHC class II molecules (8, 19). The transcriptional regulation of CIITA is controlled by four independent promoter units, each transcribing a unique first exon, which are located within a region upstream of the CIITA gene of ∼14 kb (20). Promoters I and III (PI and PIII) are used for the constitutive expression of CIITA in respectively dendritic cells and B lymphocytes. Interestingly, CIITA-PIII is also used by activated T cells in humans (21). The expression characteristics and function of promoter PII are still unknown, and promoter PIV has been shown to be the promoter predominantly involved in IFN-γ-inducible CIITA expression (22, 23). B lymphocyte-specific MHC class II expression is stringently regulated during B cell differentiation. Human B lymphocytes express MHC class II molecules as early as the pro-B cell stage, and their expression is maintained until they differentiate into plasma cells (24). At this stage CIITA transcription mediated by CIITA-PIII is also down-regulated (20, 25, 26). Functional analysis of CIITA-PIII showed that the region immediately upstream of the translation initiation site, starting at position −322 bp, is sufficient to confer B lymphocyte-specific expression of a reporter gene construct (20, 27, 28). Interestingly, addition of a 4-kb region (CIITA-PIIIDEL1) located 2 kb upstream of the CIITA-PIII core promoter region results in IFN-γ-inducible expression of CIITA-PIII in non-B cells (23, 28). Using in vivo DNA footprinting analysis of the region upstream of the first exon, five segments were found occupied in CIITA-PIII in the B cell line Raji (29, 30). Subsequently, it was established that two of these segments, activation response element-1 (ARE-1) and ARE-2, appeared to be absolutely required for trans-activation of CIITA-PIII in B lymphocytes (29). However, nothing is known about the factors that bind to the specific DNA elements that play a role in the activation of CIITA expression in B cells. In this study we have identified, in addition to ARE-1 and ARE-2, a novel regulatory region in the 5′-untranslated region (5′-UTR) that plays an important role in the activation of CIITA-PIII in B lymphocytes. The 5′-UTR harbors several CREs that are bound by CREB-1 and ATF-1, as shown by EMSA. Furthermore, it is also demonstrated that ATF/CREB factors bind to the CRE located in ARE-2. Binding of CREB-1 to CIITA-PIII in vivo was corroborated by chromatin immunoprecipitation assay with a CREB-1-reactive Ab. Moreover, transient transfection assays using a CIITA-PIII luciferase reporter in combination with a CREB-1 or ATF-1 expression construct resulted in a dose-dependent up-regulation of CIITA-PIII in B cell lines only. Together these data implicate CREB-1 and ATF-1 as factors that participate in the regulation of CIITA expression mediated by CIITA-PIII. The following cell lines (American Type Culture Collection, Manassas, VA) were used in this study: Raji and Ramos-RA-1, two Burkitt lymphomas of which Raji harbors the human EBV; Jurkat (clone E6-1), an acute T cell leukemia; THP-1, a monocytic-derived cell line; and HeLa, a human cervical carcinoma. WSI is an SV40-transformed fibroblast cell line (31). All cell lines were cultured in IMDM (BioWhittaker, Verviers, Belgium) supplemented with 10% heat-inactivated FBS (Greiner, Alphen a/d Rijn, The Netherlands), 100 IU/ml streptomycin, and 100 IU/ml penicillin. Nuclear extract (NE) preparations and EMSAs were performed as described previously (12). The following oligonucleotides were used as probes: consensus CRE (con-CRE): sense, 5′-AGAGATTGCCTGACGTCAGAGAGCTAG-3′; and antisense, 5′-CTAGCTCTCTGACGTCAGGCAATCTCT-3′; wild-type (wt)-ARE-2-CRE: sense, 5′-GAGTTTTTTTGATGATCCCTCACTTGT-3′; and antisense, 5′-ACAAGTGAGGGATCATCAAAAAAACTC-3′; and the mut-ARE-2-CRE containing the mutated CRE (as indicated in lower case): sense, 5′-GAGTTTTTTTGAccgggCCTCACTTGTTTC-3′; and antisense, 5′-GAAACAAGTGAGGcccggTCAAAAAAACTC-3′. The binding motif is underlined. In addition, a panel of 18 20-bp-long oligonucleotides probes that represent the sequence of the region −113 to +87 of CIITA-PIII and overlap 10 bp was generated and used for EMSA. Probes were named after the nucleotide region of the CIITA-PIII sequence they represent. Supershift assays were performed by adding 1 μg of Ab to 10 μl of the NEs and probe mixture and incubating for 60 min at 4°C. The following Abs were used for supershift assays: ATF/CREB (sc-270) reactive with ATF-1 p35, CREB-1 p43, and cAMP-responsive element modulator (CREM-1); ATF-1 (sc-243) specific for ATF-1 p35; ATF-2 (sc-187) specific for ATF-2; ATF-3 (sc-188) specific for ATF-3; CREM-1 (sc-440) reactive with CREM-1 and some partial cross-reactivity with other CREM isoforms; CREB-2 (sc-200) specific for CREB-2 (ATF-4); c-Jun (sc-822) specific for c-Jun phosphorylated on serine 63; c-Fos (sc-52) specific for c-Fos; and CREB-1 (sc-271) specific for CREB-1 and a CREB-1 antiserum reactive with CREB-1 and some partial cross-reactivity with ATF-1. All Abs were obtained from Santa Cruz Biotechnology (Santa Cruz, Sanver Tech, The Netherlands), except the CREB-1 antiserum, which was a gift from Dr. J. M. Boss. IVGF analysis was performed with genomic DNA derived from the B cell lines Raji and Ramos and Jurkat T cells. Genomic DNA was isolated from cells treated with dimethylsulfate and after piperidine treatment used for the ligation-mediated IVGF-PCR as described by Mueller and Wold (32) with minor modifications (33). The following primers were used for the IVGF analysis of the coding strand of the 5′-UTR region of CIITA-PIII: 5 utr.31, 5′-+206TTAAGATGCTTTCCCGGCCTTTTTACC+182-3′; 5 utr.32, 5′-+139GCAACGCATTGTGTAGGAATCCC+117-3′; and 5 utr.33, 5′-+132ATTGTGTAGGAATCCCAGCCAGGCAG+107-3′. ChIP assays were performed as described by Moreno et al. (34, 35, 36). Genomic DNA derived from formaldehyde-treated Raji cells was sonicated using a microtip until the average DNA fragments were ∼600 bp. Immunoprecipitations were performed at 4°C for 2.5 h with 5 μg of primary Ab, and immune complexes were harvested with secondary sheep anti-rabbit Abs linked to M-280 Dynalbeads (Dynal, Oslo, Norway). The following primary Abs were used: CREB-1 antiserum reactive with CREB-1 and some partial cross-reactivity with ATF-1 (36), Stat1α-reactive Ab (sc-345X) specific for Stat1, and CREB-binding protein (CBP)-reactive Ab (sc-369X) specific for CBP p265 (Santa Cruz Biotechnology). Isolated immune complexes were elaborately washed and subsequently disrupted. DNA samples were precipitated and purified by proteinase K digestion, phenol/chloroform extraction, and ethanol precipitation. All samples were dissolved in 50 μl of H2O, and 3 μl was used as a template for PCR using primers PIII-creb-chip (sense, 5′-−192CAGTCCACAGTAAGGAAGTGAAATTA−167-3′) and PIII-creb-chip (antisense, 5′-−8CCAGTTGGGAGCCCGCCAAGCTAA−36-3′), which amplifies a 184-bp fragment that harbors the ARE-2-CRE located in the ARE-2 region. As a control the IFN-γ-activated site (GAS) box fragment from CIITA-PIV was amplified using the primers PIV-stat-chip (sense, 5′-−247TCCTGGCCCGGGGCCTGG−230-3′) and PIV-stat-chip (antisense, 5′-+72CTGTTCCCCGGGCTCCCGC+54-3′), which generates a fragment of 319 bp. GAPDH fragments were amplified using primers described previously (37). All PCRs were performed in a total reaction volume of 50 μl containing 1× PE PCR reaction buffer (PerkinElmer, Roche Molecular Systems, Branchburg, NJ), 6 mM MgCl2, 0.5 mM of each dNTP, 10 pmol of each primer, and 2.5 U AmpliTaq DNA polymerase (PerkinElmer, Roche Molecular Systems,). All cycles lasted 1 min and contained an annealing step at 63°C. The pGL3-CIITA-PIII reporter construct used in this study was created by subcloning the 668-bp KpnI/TfiI CIITA-PIII fragment from pGL2-CIITA-PIIIDEL1 (a gift from Dr. J. P.-Y. Ting) (28) into the pGL3-Basic luciferase reporter plasmid (Promega, Madison, WI). This promoter fragment encompasses the CIITA-PIII DNA region −545 to +123 bp. Mutations in the ARE-2-CRE (bp −62 to −55), as present in construct pGL3-CIITA-mut-CRE-PIII, were introduced into the pGL3-CIITA-PIII promoter fragment by site-directed mutagenesis using the oligonucleotides mut-ARE-2-CRE sense and antisense indicated above in an overlapping extension PCR (38). Upstream and downstream pGL3 −CIITA-PIII deletion constructs were generated by PCR amplification. Promoter fragments of constructs 4–7, as indicated in Fig. 4⇓A, and construct 3, as indicated in Fig. 4⇓B, were created by amplifying the regions −113 to +123, −113 to +47, −113 to +3, −545 to +3, and −545 to +87, respectively, from pGL3-CIITA-PIII using primer sets PIII−113-sense (5′-AGATCTGAAACAGAAATCTGACCGCTTGG-3′) and RV3 (Promega, Madison, WI), PIII−113-sense and PIII+47-antisense (5′-ATGCCCAGCTCAGAAGCACA-3′), PIII−113-sense and PIII+1-antisense (5′-AAGCTTAACCAGTCACCAGTTGGGAGCC-3′), GL2 (Promega, Madison, WI) and PIII+1-antisense, and GL2 and PIII+87-antisense (5′-TCCTCGTGCCCTCAGCTTCC-3′), respectively. Promoter fragments of constructs 8 and 9, as indicated in Fig. 4⇓A, were created by amplifying the regions −545 to +3 and from −113 to +3 of pGL3-CIITA-mut-CRE-PIII using primer sets GL2 and PIII+1-antisense, and PIII−113-sense and PIII+1-antisense, respectively. All promoter fragments were cloned into pGL3. The pGL3-CIITA-PIIIDEL1 construct was created by subcloning the CIITA-PIIIDEL1 fragment from pGL2-CIITA-PIIIDEL1 into pGL3-Basic (28). The pGL3-DRA luciferase reporter construct contains the MHC class II DRA SXY module and has been described previously (12). The expression constructs used were pRs/RSV-CBP (gift from Dr. R. Goodman) (39), pECE/RSV-ATF-1 (gift from Dr. M. R. Green) (40), pSG5-inducible cAMP early repressor (pSG5-ICER; gift from Dr. P. Quinn), and pMT-protein kinase A (pMT-PKA; gift from Dr. S. McKnight). The cell lines Raji, Ramos, and Jurkat were transfected by electroporation (Genepulser, Bio-Rad, Hercules, CA) at 250 V and 960 μF and harvested after 48 h. Electroporations were performed with 107 cells and 10 μg of luciferase pGL3-reporter construct in combination with 2.5 μg of SV40-Renilla pGL3-reporter construct as an internal control (Promega). Expression constructs were added as indicated. HeLa cells (2 × 105 cell/well) were transfected in six-well plates (Costar, Cambridge, MA) with 1 μg luciferase pGL3-reporter construct in combination with 0.25 μg SV40-Renilla pGL3-reporter construct and the indicated expression constructs using the calcium phosphate coprecipitation method (41). Transfections were performed in quadruplicate, and cells were harvested after 48 h. Luciferase and Renilla luciferase activities were measured according to the manufacturer and were normalized for transfection efficiency with the Renilla luciferase assay (Promega). As shown previously, IVGF analysis of the CIITA-PIII region upstream of the transcription initiation site in the B cell line Raji indicated the presence of several protected sites (21, 29, 30) (data not shown), of which the ARE-2 showed strong similarity with a CRE (Fig. 1⇓A). To determine whether ATF/CREB family members bind to this element in B cells, EMSAs were performed using NEs from the B cell line Raji and the probes ARE-2-CRE and cons-CRE (see Materials and Methods). Binding characteristics of the cons-CRE probe were compared with those of the ARE-2-CRE probe and were further analyzed through supershift analyses with Abs specific for ATF/CREB family members. As shown in Fig. 1⇓B, the three main protein/DNA complexes that were detected with the cons-CRE probe were also detected with the ARE-2-CRE probe and were found to belong to the ATF/CREB family of transcription factors. This was revealed in a supershift analysis using the ATF/CREB multireactive Ab and Abs directed against CREB-1 and ATF-1 (Fig. 1⇓B, compare lanes 1 and 4 with lanes 8 and 11). Inclusion of the CREB-1-specific antiserum indicated the presence of a homodimer of CREB-1 in the upper indicated complex (Fig. 1⇓B, lanes 5 and 12). The lower indicated complex was found to contain a homodimer of ATF-1, since it was lost upon incubation with the ATF-1-specific mouse mAb (Fig. 1⇓B, lanes 6 and 13). Of note, the interaction of ATF-1 with the cons-CRE probe and the subsequent supershift analysis of this complex appears more efficient compared with the ARE-2-CRE probe. All other tested specific Abs reactive with CRE binding factors (ATF-2, ATF-3, CREB-2, c-Fos, and c-Jun including CREM-1) did not give rise to a supershift or loss of binding to the ARE-2-CRE probe (data not shown), making identification of the third ATF/CREB-specific complex located between the CREB-1- and ATF-1-containing complexes more difficult. Remarkably, the intensity of this third complex appears reduced, especially with the ARE-2-CRE probe, upon incubation with either the ATF-1- or CREB-1-specific Abs (Fig. 1⇓B, lanes 5, 6, 12, and 13) and is reduced severely upon incubation with a combination of both the ATF-1- and CREB-1-specific Abs (data not shown), suggesting the presence of both proteins in this complex. The inclusion of an isotype control Ab specific for Stat1, a factor not related to CREBs, to the protein/DNA binding assay did not reveal any supershifts or depletion of complexes with either probe, indicating the specificity of the other supershifts (Fig. 1⇓B, lanes 7 and 14). CREB-1 and ATF-1 bind to the putative CRE in ARE-2 of CIITA-PIII. A, Schematic presentation of CIITA-PIII (545 bp) analyzed in this study and location of ARE-2-CRE. B, Autoradiograph of an EMSA using the 32P-labeled cons-CRE (lanes 1–7) and the wt-ARE-2-CRE (lanes 8–15) as probes incubated with NEs of Raji B cells (lanes 1–14) and HeLa cells (lane 15). Competition analyses were performed using unlabeled cons-CRE (lanes 2 and 10) and wt-ARE-2-CRE probes (lanes 3 and 9) in 100-fold excess. Supershift analyses were performed using an Ab reactive against ATF/CREB in lanes 4 and 11, CREB-1 in lanes 5 and 12, and ATF-1 in lanes 6 and 13. The ATF-1- and CREB-1-containing complexes are indicated with arrows. Lanes 7 and 14 represent the control Stat1 Ab. Competition of the ARE-2-CRE complexes with a 100-fold excess of unlabeled cons-CRE probe resulted in the disappearance of the ATF/CREB-specific bands (Fig. 1⇑B, lane 10). However, a 100-fold excess of unlabeled ARE-2-CRE probe, unlike a 100-fold excess of cons-CRE probe, did not compete with the cons-CRE complexes (Fig. 1⇑B, compare lanes 3 and 2), reflecting a lower affinity of ARE-2-CRE for ATF/CREB transcription factors. Together these results revealed that both ATF-1 and CREB-1 bind to the CRE in ARE-2 of CIITA-PIII in vitro. To further evaluate the role of ATF/CREB factors in transcriptional up-regulation of CIITA-PIII in B cells, transient cotransfection experiments were performed using the CIITA-PIII luciferase reporter and increasing amounts of CREB-1 and ATF-1 expression constructs. Cotransfection of a CREB-1 expression construct increased CIITA-PIII luciferase reporter expression in a dose-dependent manner in Raji B cells (Fig. 2⇓A, lanes 1–4). The highest addition of CREB-1 expression construct (10 μg) resulted in an average 6-fold increase in luciferase activity (Fig. 2⇓A, lane 4). Similar cotransfections using an ATF-1 expression construct resulted in a dose-dependent up-regulation of CIITA-PIII luciferase reporter activity, with a maximum 4-fold induction (Fig. 2⇓B, lane 4). 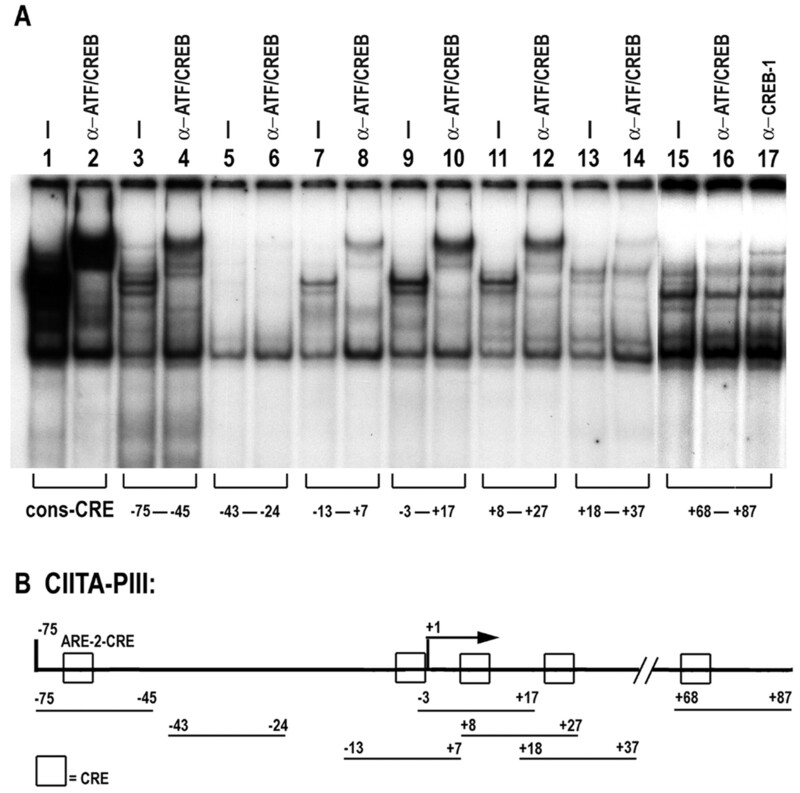 Cotransfection of both CREB-1 and ATF-1 gave rise to variable results and showed in most cases only a modest additive effect on CIITA-PIII-mediated reporter activity (Fig. 2⇓B, lane 5). CREB-1 and ATF-1 enhance CIITA-PIII transcription activity. Raji B cells were transfected by electroporation with 10 μg of the CIITA-PIII luciferase reporter (pCIITA-PIII) in combination with ATF/CREB and CBP expression constructs. A, pCIITA-PIII alone (lane 1), pCIITA-PIII and increasing amounts of pRs/RSV-CREB-1 as indicated (lanes 2–4), pCIITA-PIII and pRs/RSV-CBP (5 μg; lane 5), pCIITA-PIII, pRs/RSV-CREB-1 (2.5 μg) and pRs/RSV-CBP (5 μg; lane 6). B, pCIITA-PIII alone (lane 1), pCIITA-PIII and pRs/RSV-CREB-1 as indicated (lane 2), pCIITA-PIII and increasing amounts of a pECE/RSV-ATF-1 as indicated (lanes 3 and 4), pRs/RSV-CREB-1 (2.5 μg) and pECE/RSV-ATF-1 (2.5 μg; lane 5), and pECE/RSV-ATF-1 (2.5 μg) and pRs/RSV-CBP (5 μg; lane 6). Next we investigated whether the general coactivator CBP (39, 42, 43) could exert an enhancing role in CREB/ATF-mediated CIITA-PIII trans-activation. Therefore, transient transfection experiments were performed with CBP in the presence or the absence of exogenous CREB-1 or ATF-1. Transfection of CBP only did not result in an enhancement of CIITA-PIII activity (Fig. 2⇑A, lane 5). However, cotransfection of CBP with CREB-1 resulted in a significant up-regulation of CIITA-PIII activity (Fig. 2⇑A, compare lanes 2 and 6), whereas in the presence of ATF-1 a modest up-regulation was also noted (Fig. 2⇑B, compare lanes 3 and 6). Together, these results show that both CREB-1 and ATF-1 are functionally involved in CIITA-PIII trans-activation and that CBP can only up-regulate this activity after the addition of exogenous CREB-1 and/or ATF-1. To further investigate the role of CREB-1 and ATF-1 in the transcriptional trans-activation of CIITA-PIII through the identified CRE in ARE-2 of CIITA-PIII, we generated a mutant ARE-2-CRE (mut-ARE-2-CRE) probe and a mutant CIITA-PIII luciferase reporter construct (CIITA-mut-CRE-PIII) that harbors the same mutant CRE sequence (Fig. 3⇓A). 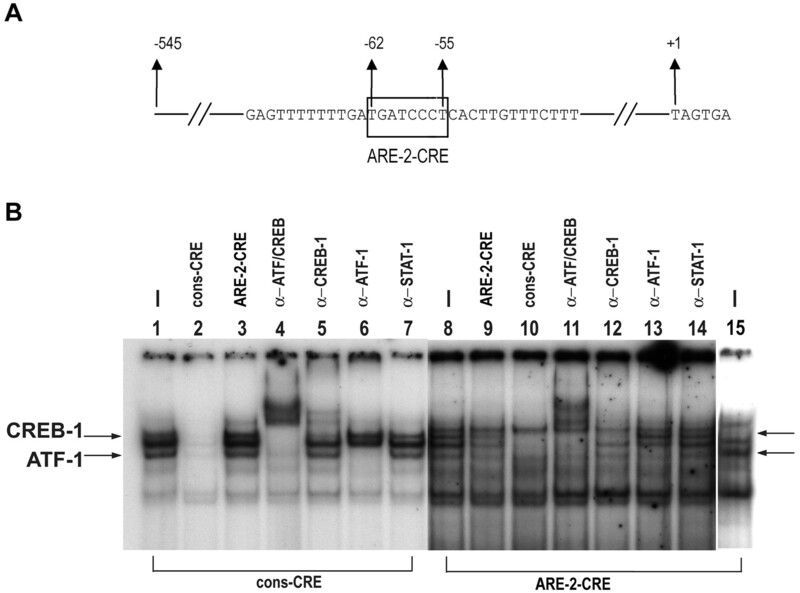 Gel retardation assays with both the wt-ARE-2-CRE probe and the mut-ARE-2-CRE probe showed that mutation of the CRE in ARE-2 abolished ATF/CREB binding using NEs derived from Raji cells (Fig. 3⇓B). Mutation of the CRE in ARE-2 of CIITA-PIII results in loss of binding of ATF-1 and CREB-1 and transcriptional activation. A, Oligonucleotides used in gel retardation assay. Mut-ARE-2-CRE contains five point mutations in the center of the CRE of the CIITA-PIII-ARE-2, which are indicated in lowercase and are underlined. 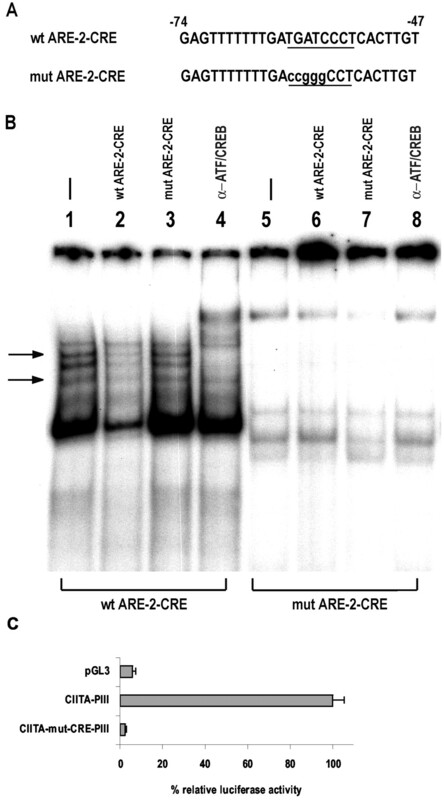 B, Autoradiograph of an EMSA using the 32P-labeled wt-ARE-2-CRE (lanes 1–4) or the mut-ARE-2-CRE (lanes 5–8) as a probe incubated with NEs isolated from Raji B cells. Lanes 2 and 6 show competition analysis with a 100-fold molar excess of unlabeled wt-ARE-2-CRE probe. Lane 3 and 7 show competition analysis with 100-fold molar excess of unlabeled mut-ARE-2-CRE probe. Lanes 4 and 8 show a supershift analysis using an Ab reactive against ATF/CREB. The ATF-1- and CREB-1-retarded complexes are indicated with arrows. C, Mutation of the CRE in ARE-2 results in severe repression of CIITA-PIII-mediated transcription. Raji B cells were transfected with 10 μg of pGL3-basic reporter (lane 1), 10 μg of CIITA-PIII luciferase reporter (lane 2), or 10 μg of the CIITA-mut-CRE-PIII reporter (lane 3). The luciferase value of CIITA-PIII is set at 100%, and other values are relative to CIITA-PIII. Luciferase values were corrected for transfection efficiency with Renilla luciferase values and are shown as the mean ± SD (n = 4). Next we wanted to see whether this loss of ATF/CREB binding to the ARE-2-CRE results in repression of CIITA-PIII activity. Raji B cells were transfected with either wt- or mut-CIITA-ARE-2-CRE-containing luciferase reporter constructs. Mutation of the CIITA-ARE-2-CRE sequence resulted in a severe to almost complete loss of CIITA-PIII reporter activity (Fig. 3⇑C), indicating a crucial role of this ATF/CREB binding element in constitutive promoter activity of CIITA-PIII in B cells. Interestingly, cotransfection of CREB-1 with CIITA-mut-CRE-PIII showed that the increase in CREB-1 expression still resulted in up-regulation of promoter activity. However, the level of absolute promoter activity was much lower compared with cotransfection of CREB-1 with the wt CIITA-PIII reporter construct (Fig. 4⇓A, compare lanes 2 and 3 (+CREB-1)). These results indicate that in addition to the CRE in ARE-2, other CREs are either directly or indirectly involved in the up-regulation of CIITA-PIII activity in B cells. Close examination of the CIITA-PIII DNA sequence, including the 5′-UTR, revealed several additional putative CREs downstream of the CRE in ARE-2, as indicated in Fig. 5⇓B. To evaluate whether these additional CREs indeed bind ATF/CREB factors, EMSA analyses were performed with the cons-CRE probe, the ARE-2-CRE probe, and a series of overlapping probes that encompass nucleotide region −113 to +87 of CIITA-PIII (see Materials and Methods). In this way the following CREs were identified at position −7 to +1, +8 to +15, +20 to +27, and +69 to +76 of the CIITA-PIII DNA sequence. As shown in Fig. 5⇓A, lanes 7–17, all four putative CREs generated complexes that contain ATF/CREB factors, of which three show identical patterns as observed with the cons-CRE and the ARE-2-CRE probes (Fig. 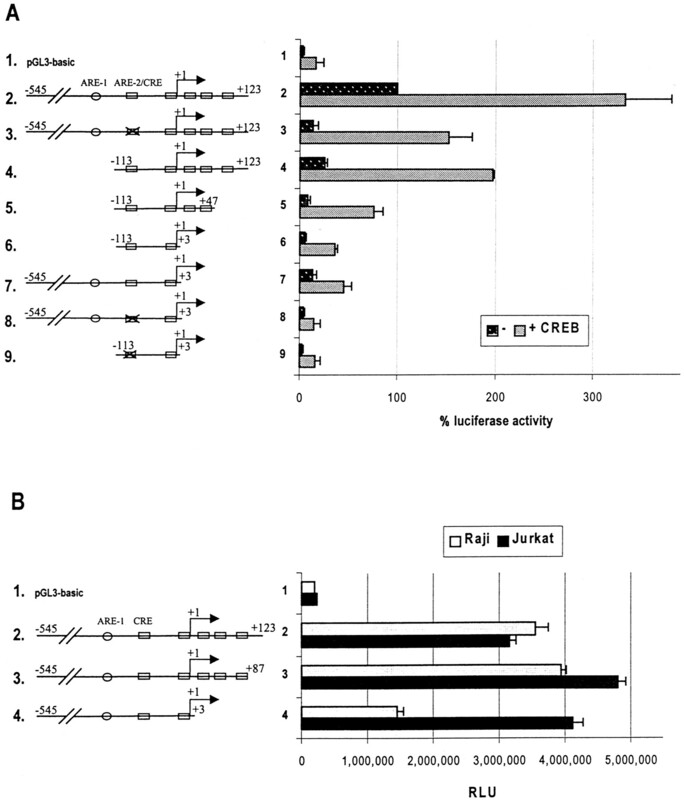 5⇓A, lanes 1–4), whereas the CRE located in the +68 to +87 region only interacts with CREB-1 (Fig. 5⇓A, lanes 15–17). All other probes did not generate complexes that contained ATF/CREB factors, as exemplified with the probe that spans bp −43 to −24 (Fig. 5⇓A, lanes 5 and 6). Additional downstream CREs mediate CREB-1 induced up-regulation of CIITA-PIII activity in B cells. A, A panel of different pGL3-CIITA-PIII mutants was generated by site-directed mutagenesis and PCR amplification and is shown together with the full-length pGL3-CIITA-PIII, indicated as construct 2. Raji B cells were transfected by electroporation with 10 μg of the following indicated luciferase reporter constructs: pGL3-Basic (lane 1), pCIITA-PIII (lane 2), pCIITA-mut-CRE-PIII (lane 3), pCIITA-PIII−113 (lane 4), pCIITA-PIII−113+47 (lane 5), pCIITA-PIII−113+3 (lane 6), pCIITA-PIII+3 (lane 7), pCIITA-mut-CRE-PIII+3 (lane 8), and pCIITA-mut-CRE-PIII−113+3 (lane 9), with or without the addition of 5 μg of CREB-1 expression construct. The luciferase value of CIITA-PIII was set at 100%. B, Raji B cells and Jurkat T cells were transfected with 10 μg of the following indicated luciferase reporter constructs: pGL3-Basic (lane 1), pCIITA-PIII (lane 2), pCIITA-PIII+87 (lane 3), and pCIITA-PIII+3 (lane 4). All transfections were performed with similar amounts of plasmid DNA by adding empty pRs/RSV vector. Luciferase values were corrected for transfection efficiency with Renilla luciferase values and are shown as the mean ± SD (n = 3). Additional CREB binding sites in CIITA-PIII. Eighteen 20-bp probes spanning from nucleotide −113 to +84 of the CIITA-PIII region were tested for ATF/CREB binding with NEs derived from Raji B cells. A, All probes that formed ATF/CREB-containing complexes are shown together with the control probes cons-CRE and ARE-2-CRE: lanes 1 and 2, cons-CRE; lanes 3 and 4, ARE-2-CRE (−75 to −45); lanes 5 and 6, probe −43 to −24; lanes 7 and 8, probe −13 to +7; lanes 9 and 10, probe −3 to +17; lanes 11 and 12, probe +8 to +27; lanes 13 and 14, probe +18 to +37; and lanes 15–17, probe +68 to +87. The probes used are indicated below the lanes and are named after the promoter region they represent. All even-numbered lanes show a supershift analysis with the ATF/CREB-reactive Ab, and lane 17 shows a supershift analysis with the CREB-1-specific Ab. Probes are indicated below the lanes. B, Schematic presentation of CRE-containing region of CIITA-PIII scanned for ATF/CREB binding factors starting at nucleotide −75, the sequence that harbors ARE-2-CRE and ends at nucleotide +87. Nucleotide position of probes used in EMSA analysis of A are indicated below map. CREs are indicated with squares. Subsequently, we investigated the roles of these additional CREs in constitutive and CREB-1-mediated trans-activation of CIITA-PIII. A set of mutant CIITA-PIII luciferase reporter constructs was generated that harbors variable amounts of the indicated CREB binding elements, as shown in Fig. 4⇑A. First, we analyzed a minimal CIITA-PIII reporter construct that only contained all identified CREs (Fig. 4⇑A, lane 4). As shown in Fig. 4⇑A, the constitutive activity of this construct in Raji B cells was reduced compared with that of the full-length CIITA-PIII. This is most likely due to the absence of the ARE-1 element. However, addition of CREB-1 gave rise to a strong induction (8-fold) of luciferase activity (Fig. 4⇑A, lane 4 (+CREB)). Interestingly, deletion of the most 3′-located CRE (+69 to +76 bp) from construct 4 resulted in a strong reduction of both constitutive and CREB-1-induced luciferase activity (compare Fig. 4⇑A, lanes 4 and 5). The CREB-1-mediated induction measured with reporter constructs 4 and 5 was even more diminished after deletion of the entire 5′-UTR (Fig. 4⇑A, lane 6 (+CREB)). Similarly, a strong reduction was observed after deletion of the 5′-UTR from full-length CIITA-PIII (Fig. 4⇑A, lane 7 (+CREB)). The observed reduction in luciferase activity with both constructs 6 and 7, with and without the addition of CREB-1, indicates an important role of the 5′-UTR of CIITA-PIII in the CREB-1-induced and constitutive promoter activity and suggests the absence of other functional CREs upstream of bp −113. Additional mutation of the ARE-2-CRE site from constructs 6 and 7 resulted in a further reduction of the constitutive and CREB-1-induced activity levels, which were similar to the background levels observed with pGL3-Basic (Fig. 4⇑A, compare lanes 9 and 8, respectively, with lane 1). Recently, we observed specific expression of CIITA-PIII in activated human T cells (21). Similar to B cells, both ARE-1 and ARE-2 appeared to be important for the activation of CIITA-PIII in T cells. Therefore, we also investigated the role of the 5′-UTR in the transcriptional regulation of CIITA-PIII in Jurkat T cells. As shown in Fig. 4⇑B, similar activities were observed with the full-length CIITA-PIII reporter construct (lane 2) in Raji B cells and Jurkat T cells. However, deletion of the 5′-UTR from CIITA-PIII not only resulted in strongly reduced B cell-mediated activity, but had no effect on the T cell-mediated activity of CIITA-PIII (lane 4). Transfection of the same CIITA-PIII reporter constructs in another B cell line, Ramos, resulted in similar results as obtained with Raji B cells (data not shown). Together these results indicate that ATF-1 and CREB-1 can interact with a succession of putative CREs located in the CIITA-PIII region and that these elements play an important role in the CREB-1-mediated up-regulation of CIITA-PIII activity in B cells. Moreover, the 5′-UTR of CIITA-PIII plays a critical role in the constitutive expression of CIITA-PIII, which appears to be, in contrast to ARE-1 and ARE-2, important for its expression in B cells. Considering the difference in trans-activation of CIITA-PIII in B and T cells after deletion of the 5′-UTR, we also investigated whether direct protein/DNA interactions at the 5′-UTR of CIITA-PIII would account for this phenomenon. IVGF analyses were performed with dimethylsulfate-treated genomic DNA of Jurkat T cells and of the B cell lines Ramos and Raji (data not shown) as described in Materials and Methods. Comparison of the footprints obtained revealed that several of the CRE motifs in B cells displayed some occupancy, which was not evident in Jurkat T cells. As shown in Fig. 6⇓, lane 2, the protein occupation at the CRE located at −6 to +3 is faint and comparable to the occupation of site A. However, the three other indicated CRE regions are more clearly occupied (Fig. 6⇓, lane 2). In addition to the CRE motifs we observed several other regions that were occupied by proteins in the IVGF analysis, of which some were visible in both B and T cells and some were only visible in B cells (Fig. 6⇓, indicated with arrows). Together these results indicate that in vivo the 5′-UTR of CIITA-PIII is differently occupied by proteins in B and T cells. IVGF analysis of the 5′-UTR of CIITA-PIII reveals differences in protein/DNA interactions between B and T cells. IVGF analysis was performed using primers specific for the coding strand of the 5′-UTR of CIITA-PIII (as described in Materials and Methods) with the following genomic DNA samples: lane 1, in vitro methylated DNA of Raji B cells; lane 2, in vivo methylated DNA of Ramos B cells; and lane 3, in vivo methylated DNA of Jurkat T cells. Site A and CRE sites are indicated on the left, and the protein occupation of the CREs (brackets) and other elements (arrows) are indicated on the right of lanes 2 and 3. The double arrow indicates a signal enhancement. The nucleotide positions of CREs and B cell-specific occupations are indicated on the right, including the starting position of IVGF. The ICER expression construct was used to elucidate whether the endogenously expressed CREB-1 and ATF-1 factors play important roles in the transcriptional activation of CIITA-PIII in B cells. ICER contains essentially only the DNA binding domain of the CREM-1 gene and functions as a repressor of cAMP-induced transcription (44). We used the HLA-DRA promoter, as a control luciferase reporter, since it has also been shown to be down-regulated by ICER through its interaction with the HLA-DRA X2 box in Raji B cells (36). As shown in Fig. 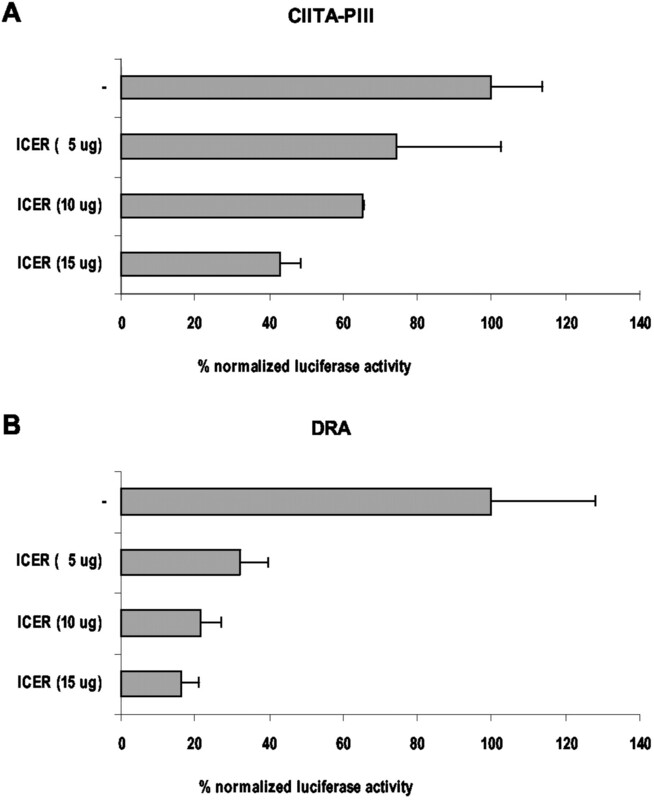 7⇓, both the CIITA-PIII reporter (A) and the control HLA-DRA reporter (B) were down-regulated by ICER in a dose-dependent fashion in Raji B cells, albeit that the activity of CIITA-PIII was less effected by ICER (∼2-fold) compared with the HLA-DRA promoter. Together these data show that ICER down-modulates the constitutive transcriptional activity of CIITA-PIII, which supports a role for endogenously expressed ATF-1 and CREB-1 in the trans-activation of CIITA-PIII expression in B cells. ICER represses transcription from CIITA-PIII. Raji B cells were transfected with either 10 μg CIITA-PIII luciferase reporter construct (A) or 10 μg of the HLA-DRA luciferase reporter construct (B) in combination with the indicated amount of the pSG-ICER expression construct. Experiments were performed in triplicate. Luciferase values were normalized to those obtained with the reporter construct alone and are shown as the mean ± SD (n = 3) . Direct in vivo association of CREB-1 with CIITA-PIII was investigated through a ChIP assay, using the CREB-1-specific Ab (see Materials and Methods). 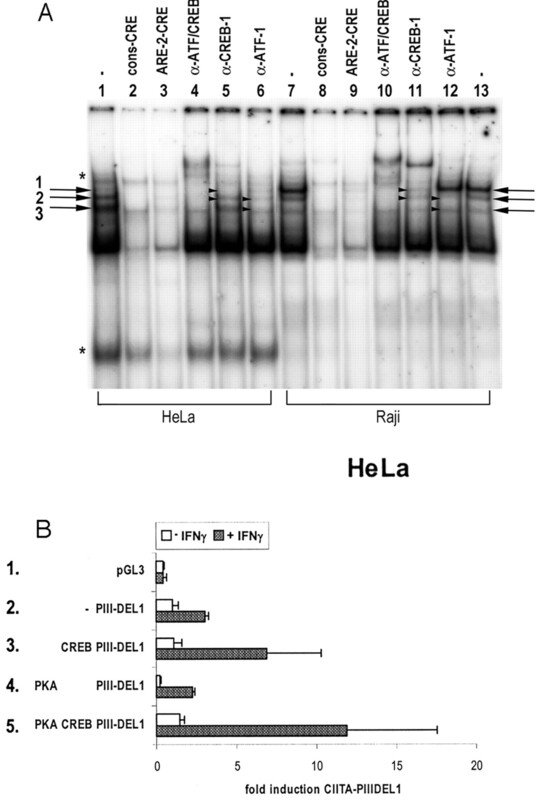 PCR products were obtained when the CREB-1-specific Ab was used in the immunoprecipitation or with the control samples containing either sonicated Raji chromatin or purified genomic DNA from THP-1 cells (Fig. 8⇓A, lanes 2, 5, and 8). No PCR products were obtained when a Stat1-specific control Ab or no primary Ab was used in the immunoprecipitation (Fig. 8⇓A, lanes 3 and 6). As a control for the specificity of the CREB-1 Ab used in the CIITA-PIII ChIP assay we also performed PCRs with primers that specifically amplify a fragment of 319 bp of the CIITA-PIV region that harbors a GAS box and no functional CREs (see Materials and Methods). As shown in Fig. 8⇓B, CIITA-PIV-specific PCR products were only obtained using DNA isolated after Stat1-specific immunoprecipitation and the control DNA samples (Fig. 8⇓B, lanes 3, 5, and 8), indicating the specificity of the ChIP-purified chromatin fragments. CREB-1 binds to CIITA-PIII-CRE region in vivo. ChIP assays were performed using sonicated genomic DNA isolated from Raji cells and Abs specific for CREB-1, Stat1α, or CBP. The subsequently purified DNA samples were used as a template for PCR with primers specific for CIITA-PIII (A), which generates a 184-bp fragment (bp −192 to −8), and CIITA-PIV (B), which generates a 319-bp fragment (bp −247 to +75) that harbors the GAS box. 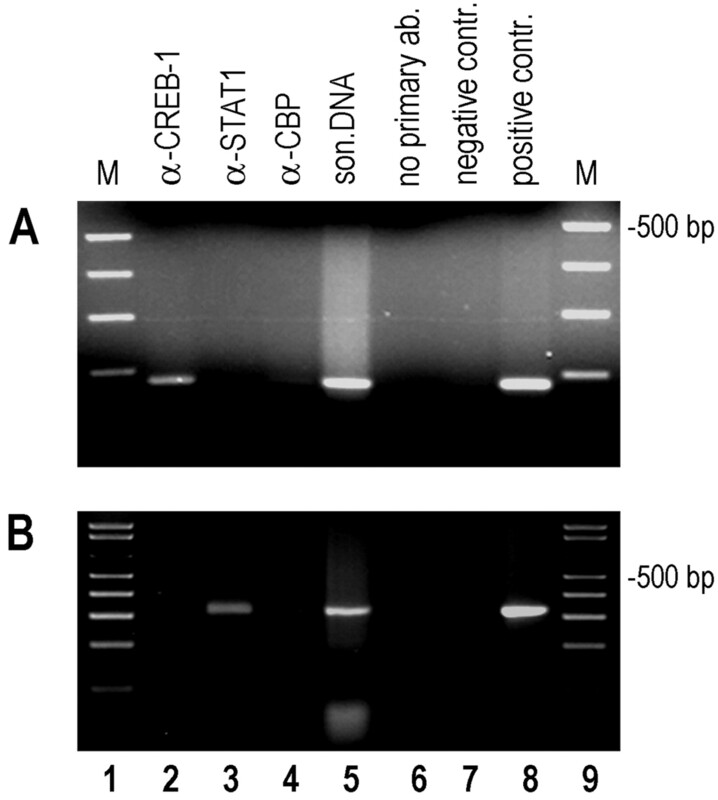 The following PCR results are shown: lane 2, using DNA purified with the anti-CREB Ab; lane 3, using DNA purified with the anti-Stat1α Ab; lane 4, using DNA purified with the anti-CBP Ab; lane 5, using sonicated DNA supernatant; lane 6, using DNA purified without addition of primary Ab; lane 7, H2O; and lane 8, using genomic DNA from THP-1 cells. Lanes 1 and 9 represent a 1-kb plus marker. Immunoprecipitation reactions performed with a CBP-specific Ab sometimes yielded a very faint band, but overall no clear PCR product was obtained with this Ab. These data indicate that CREB-1 does interact in vivo with CIITA-PIII, which corresponds with the observations from IVGF that several CREs of CIITA-PIII are occupied by proteins in vivo in B cells. The former data revealed that CREB-1 and ATF-1 play important roles in the trans-activation of CIITA-PIII in B cells. However, these factors are ubiquitously expressed. Therefore, we investigated the roles of ATF/CREB factors in the trans-activation of CIITA-PIII in other cell types. EMSA analysis revealed that the same three ATF/CREB-containing complexes are present after incubation of the probe with NEs derived from HeLa cells (Fig. 9⇓A). However, comparison of the protein/ARE-2-CRE complexes obtained with NEs derived from HeLa cells with those of Raji B cells revealed a much lower intensity of the upper indicated CREB-1-containing complex 1 in HeLa cells, whereas the intensity level of the lower indicated ATF-1-containing complex 3 appeared more prominent (Fig. 9⇓A, compare lanes 1 and 7, and Fig. 1⇑, compare lanes 8 and 15). Supershift analyses with the ATF/CREB multireactive Ab and Abs specific for CREB-1 (sc-271) and ATF-1 (sc-243) confirmed the presence of both CREB-1 and ATF-1 in the same three complexes as observed with NEs from Raji B cells (Fig. 9⇓A, compare lanes 4–6 with lanes 10–12). Again similar to Raji B cells, supershift analysis of ARE-2-CRE complexes in HeLa cells with either CREB-1- or ATF-1-specific Abs reduced the stability of all ATF/CREB-containing complexes. Comparison of the EMSA pattern obtained with NEs of Raji and HeLa cells revealed the presence of two additional complexes (indicated with asterisk in Fig. 9⇓A) present only in HeLa cells that were not reactive with the ATF/CREB multireactive antiserum or with Abs specific for other ATF/CREB family members (Fig. 9⇓A, compare lane 1 with lanes 4–6; Fig. 1⇑, compare lanes 8 and 15). EMSAs performed with NEs of the dermal fibroblast-derived cell line WSI resulted in similar bandshift patterns (data not shown). Together this indicates that in non-B cells both ATF-1 and CREB-1 can bind to the ARE-2-CRE; however ATF-1 appears to bind predominantly to this element in HeLa cells. Although CREB-1 and ATF-1 bind to the CIITA-PIII CRE probe, CREB-1 can only up-regulate IFN-γ-induced CIITA-PIII activity in HeLa cells. A, Autoradiograph of an EMSA using the 32P-labeled ARE-2-CRE as a probe incubated with NEs isolated from HeLa cells (lanes 1–6) and Raji cells (lanes 7–13). Lanes 2 and 8 show competition with the cons-CRE probe, and lanes 3 and 9 show competition with the ARE-2-CRE probe. Supershift analyses were performed using an Ab reactive against ATF/CREB (lanes 4 and 10), CREB-1 (sc-271; lanes 5 and 11), and ATF-1 (sc-243; lanes 6 and 12). ATF-1- and/or CREB-1-containing complexes 1, 2, and 3 are indicated with arrows. Complexes that were supershifted with CREB-1- and ATF-1-specific Abs are indicated with short arrows on the left of the lanes. Additional complexes in HeLa cells are indicated with an asterisk. B, HeLa cells were transfected by calcium phosphate coprecipitation with 5 μg of the pCIITA-PIIIDEL1 luciferase reporter construct in combination with 5 μg of CREB-1 and/or 5 μg of PKA expression constructs as indicated. The increase in luciferase activity is indicated relative to the CIITA-PIIIDEL1 luciferase value, which is set at 1. □, Transfections without addition of IFN-γ; ▪, addition of IFN-γ 500 U/ml. Luciferase values were corrected for transfection efficiency with Renilla luciferase values and are shown as the mean ± SD (n = 3). To test the transcriptional activity of the CIITA-PIII promoter in both uninduced and IFN-γ-treated HeLa cells and the influence of CREB-1 expression on this activity, transfections were performed using the CIITA-PIIIDEL1 reporter construct containing the upstream IFN-γ regulatory domain in addition to the same CIITA-PIII core promoter region (23). In this way we could test both the influence of CREB-1 expression on CIITA-PIII basal activity and IFN-γ-induced activity. In HeLa cells the basal level of luciferase activity of either the CIITA-PIIIDEL1 reporter or the CIITA-PIII reporter is similar to that of the empty pGL3 basic reporter (data not shown). In Raji B cells both the CIITA-PIIIDEL1 reporter and the CIITA-PIII reporter gave rise to similar high levels of luciferase activity, indicating no negative effect of the additional IFN-γ regulatory region on CIITA-PIII core activity (data not shown). Cotransfection of CREB-1 did not up-regulate the activity of CIITA-PIIIDEL1 in HeLa cells as shown in Fig. 9⇑B (compare lanes 2 and 3, □ (−IFN-γ)). 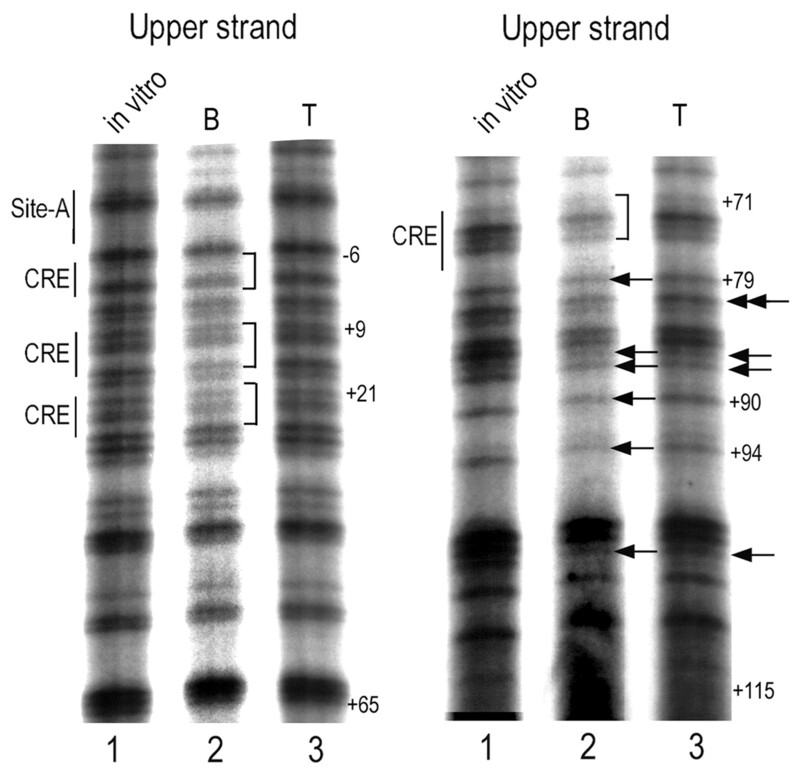 Cotransfections of CREB-1 and CIITA-PIII gave rise to similar results (data not shown). However, the moderate induction of CIITA-PIIIDEL1 by IFN-γ activity was strongly up-regulated by the addition of CREB-1 (Fig. 9⇑B, compare lanes 2 and 3, ▪ (+IFN-γ)), indicating an important role of this factor in the IFN-γ-mediated CIITA-PIII activity. To make sure that the lack of activation of CIITA-PIIIDEL1 by CREB-1 was not due to hypophosphorylation of CREB-1, we cotransfected the HeLa cells with a PKA expression construct alone and in combination with CREB-1. Cotransfection of PKA only did not induce CIITA-PIIIDEL1 activity, nor did it increase the IFN-γ-induced activity of CIITA-PIIIDEL1 (Fig. 9⇑B, lane 4). Similarly, no induction was measured after cotransfection of both PKA and CREB-1 in IFN-γ-untreated cells. Notably in IFN-γ-induced cells PKA and CREB-1 together resulted in significant up-regulation of CIITA-PIIIDEL1 compared with CREB-1 alone (Fig. 9⇑B, lane 5). Together these experiments demonstrate that despite the presence of the ATF-1 and CREB-1 transcription factors, reporter constructs CIITA-PIII and CIITA-PIIIDEL1 are not activated, which correlates with the lack of CITA-PIII-derived transcripts in HeLa cells. However, CREB-1 is a strong activator of CIITA-PIIIDEL1 after IFN-γ-mediated induction. In this study we have identified multiple CREs that play important roles in the activation of CIITA-PIII in B cells through protein/DNA interactions with ATF/CREB transcription factors. Moreover, we have identified a novel regulatory region in the 5′-UTR of CIITA-PIII which is important for expression in B cells. Deletion of the 5′-UTR resulted in severe reduction of constitutive transcriptional activation of CIITA-PIII in Raji and Ramos B cells, but not in Jurkat T cells. This region harbors three of the five CREs, whereas the other CREs were located in ARE-2 and in front of the transcriptional start site of CIITA-PIII. We show that CREB-1 and/or ATF-1 bind to all the identified CREs in vitro through EMSA analysis. Binding of CREB-1 to CIITA-PIII in vivo was confirmed by ChIP analysis with a CREB-1-specific Ab. Unfortunately, the mouse monoclonal specific for ATF-1 abolishes binding to the CRE (Fig. 1⇑, lanes 6 and 13); therefore, we could not confirm the in vivo binding of ATF-1 to CIITA-PIII through a ChIP assay. Loss of CREB-1 and ATF-1 binding to the CRE located in ARE-2 of CIITA-PIII resulted in a severe reduction of the transcriptional activation of CIITA-PIII in B cells. Similarly, deletion of the 5′-UTR comprising three CREs also resulted in a strong down-regulation of CIITA-PIII in B cells, but, interestingly, not in T cells. The important role of ATF/CREB members in the regulation of CIITA-PIII activity is further strengthened by the observation that ICER, through inhibition of endogenously expressed ATF/CREB, represses CIITA-PIII-driven luciferase reporter activity in B cells. Moreover, an increase of CREB-1 or ATF-1 expression in Raji B cells enhances the CIITA-PIII activity, and consecutive deletion of CREs results in congruent reduction of CREB-1-induced CIITA-PIII transcriptional activity. Although both cotransfections of either CREB-1 or ATF-1 alone enhances the transcriptional activity of CIITA-PIII, cotransfection of ATF-1 with CREB-1 gave rise to variable results and in most cases resulted in a moderate enhancement of the ATF-1-induced activation. 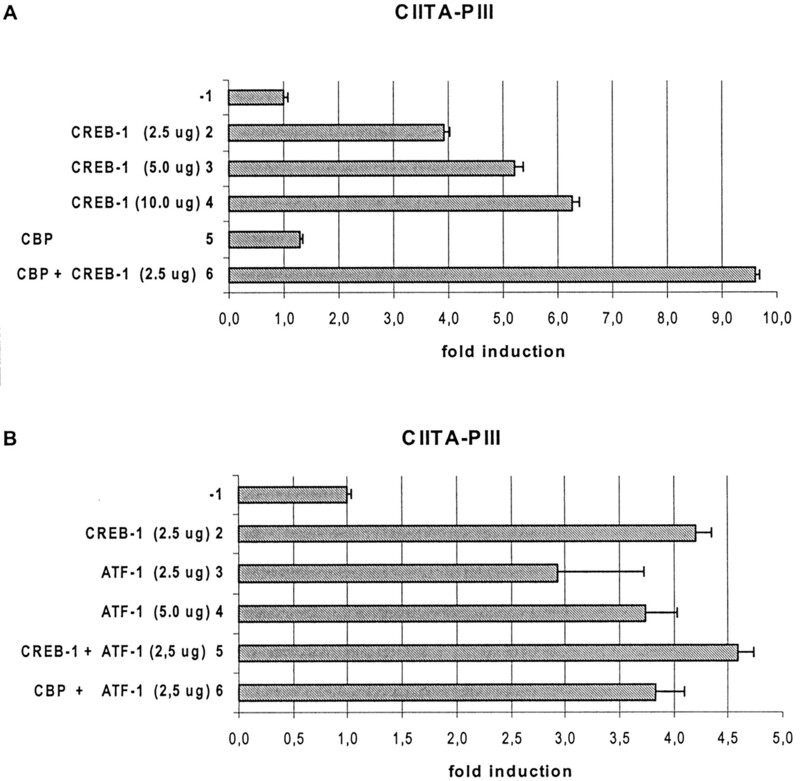 This indicates that ATF-1 can trans-activate CIITA-PIII, but suggests that CREB-1 results in stronger trans-activation of CIITA-PIII than ATF-1. CREB-1 has been shown previously to play an important role in activation of the MHC class II DRA promoter. The binding of CREB-1 to the DRA promoter was shown to be mediated through the X2 box, and its transcriptional activation is dependent on CIITA expression (34). Likewise, CREB-1 and ATF-1 were found to bind the X2 box in the MHC class I and β2-microglobulin promoter and to influence the constitutive and CIITA-induced trans-activation of these promoters (14, 16). Together with our current observation that CIITA itself is under the direct control of CREB-1 and ATF-1 in B cells, this indicates dual target sites and a potential synergy in the up-regulation of MHC class II and class I genes by ATF/CREB factors. This could also explain the stronger repression by ICER of the DRA promoter-driven luciferase reporter activity compared with that of CIITA-PIII. CREB-1 and ATF-1 are members of the leucine zipper family of transcription factors and form both homodimers and heterodimers with themselves or other leucine zipper-containing proteins (42, 45, 46). Both CREB-1 and ATF-1 proteins have been described to trans-activate cAMP-mediated transcription responses through binding to a consensus CRE or CRE-like sequence. In many cell types up-regulation of cAMP results in PKA-mediated phosphorylation of the trans-activation domain of CREB, which then induces the expression of promoters harboring CREs. In mouse splenic B cells this is achieved by treatment with anti-IgD, LPS, or PMA, which results in an increase in cAMP, phosphorylation of ATF/CREB members, and increased ATF/CREB binding to both consensus and nonconsensus CRE (47). The presence of functional CREs in both CIITA-PIII and MHC class II and class I promoters (16, 36) implies that MHC gene expression is affected by ATF/CREB and the cAMP-mediated signal transduction pathway in B cells. This is corroborated by the observation that MHC genes are, in fact, up-regulated by phosphorylated CREB-1 in mouse B cells, following cross-linking of the surface B cell receptor through a protein kinase C-dependent pathway (48). Together these data suggest that B cell receptor ligation-mediated activation pathways could also contribute to an increase in MHC class II and class I expression in human B cells. However, it is still unclear which protein kinase plays a role in the ATF/CREB-mediated up-regulation of CIITA-PIII. Although the CIITA-PIII core promoter region is specifically used in B cells, both CREB-1 and ATF-1 are ubiquitously expressed transcription factors. It is interesting to note that similar putative CRE sequences have been found in regulatory sequences of several genes that are specifically expressed in B cells (these include the Ig κ3′ enhancer and the EBV BamHI W promoter (49, 50)) or in genes that are not B cell specific but are up-regulated in a B cell-specific and Ig-regulated manner (bcl-2 and junB (51, 52)). Moreover, these CREs have been shown to be very important and in some cases essential for high B cell-specific expression of these genes. In addition, some of these studies show that ATF/CREB proteins can physically interact with other transcription factors, such as PU.1/NF-EM5 (IFN regulatory factor (IRF-4)), that bind to the Ig κ3′E (49). These interactions resulted in a synergistic increase in the level of gene transcription, and importantly, transcription could not be mediated through the CRE region alone (49). The functional synergism between the κE3′-CRE and the PU.1/NF-EM5 (IRF-4) binding sites is of interest and indicates that beside the B cell-specific PU.1/IRF-4 binding sites, additional regulatory elements, such as the CRE-containing regions, are involved in mediating B cell-specific transcription regulation. Interestingly, preliminary data have indicated an interaction of PU.1/NF-EM5 (IRF-4) with CIITA-PIII and a direct role of this protein complex in the activation of CIITA-PIII, suggesting that similar interactions with ATF/CREB factors could occur (our unpublished observations). Apart from B cell-specific promoters, other tissue-specific promoters, i.e., the phosphoenolpyruvate carboxy kinase promoter, have been shown to be transcriptionally regulated by CRE-containing regions with the requirement for upstream modules that bind tissue-specific cooperating factors that exert their activity through the interaction with CRE-bound ATF/CREB factors (53). Notably, the lack of one site is enough to accomplish a severe down-regulation of constitutive transcription. Consequently, the function of CRE-bound ATF/CREB factors is therefore determined by its specific interaction with other proteins, which clearly differs from the mechanism by which CRE regions regulate promoters that depend solely on ATF/CREB factor binding, such as the somatostatin promoter (42, 54). Similarly, one could envision that the activation of CIITA-PIII mediated by the CREs, as in the 5′-UTR, is dependent on other cis-regulatory elements. Together these cis-regulatory elements and their interacting proteins could assemble a multimolecular complex that drives B cell-specific expression of CIITA. In this respect ARE-1, ARE-2, and the 5′-UTR are essential for high expression of CIITA in B cells (29). The observation that cotransfection of CREB and PKA in non-B cell lines, such as HeLa, did not give rise to an induction of CIITA-PIII-mediated transcription suggests that other factors involved in the trans-activation of CIITA-PIII are absent in these cells or are actively repressed by an inhibitory factor. In accord with this, we detected two additional complexes with the ARE-2-CRE probe in NEs of these cell lines, which are absent in B cells. However, we do not exclude that other elements of CIITA-PIII are involved in the down-regulation of this promoter activity in HeLa cells. Furthermore, fusion experiments between B cells and fibroblast or epithelial cell lines (such as HeLa) have shown an active repression of CIITA-PIII-mediated transcription, which could only be overruled by IFN-γ activation (55, 56). The latter is mediated by the 4-kb IFN-γ regulatory region located 2 kb upstream of the CIITA-PIII core region (28). Here we show that in contrast to the CIITA-PIII core region, the IFN-γ-mediated induction of CIITA-PIII expression through CIITA-PIIIDEL1 is strongly up-regulated by the addition of exogenous CREB-1. This up-regulation underscores the important role of ATF/CREB transcription factors in the IFN-γ-mediated CIITA-PIII response. In conclusion, we show that successions of CREs found in CIITA-PIII bind CREB-1 and ATF-1 in vitro, and CREB-1 binding has also been confirmed in vivo. These CREs play an important role in CIITA-PIII activation, and increased expression of either CREB-1 or ATF-1 results in up-regulation of CIITA-PIII activity, whereas expression of ICER reduces activation of CIITA-PIII. Moreover, while the ARE-1, ARE-2-CRE, and 5′-UTR are governing the constitutive expression of CIITA in B lymphocytes, the 5′-UTR appears to be essential only for B lymphocyte expression. Our results do not exclude that apart from ATF/CREB factors, other proteins are involved in this transcriptional activation. Therefore, we hypothesize that both constitutive and IFN-γ-mediated activation of CIITA-PIII could be dependent on the promoter context of CIITA-PIII in which the ATF/CREB factors require cooperative interaction with other transcription factors. We thank J. M. Boss for providing the CREB-1-reactive antiserum; R. Goodman, P. Quinn, J. P.-Y. Ting, S. McKnight, and M. Green for providing various constructs; and T. M. Holling and E. Schooten for providing the T cell data. ↵1 This work was supported in part by the Dutch Cancer Society (RUL 98-1732) and the Dr. Gisela Thier Fund. N.v.d.S. is a fellow of the Royal Netherlands Academy for Arts and Sciences. ↵3 Abbreviations used in this paper: CIITA, class II trans-activator; ARE, activation response element; ATF, activating transcription factor; ChIP, chromatin immunoprecipitation; CIITA-PIII, CIITA promoter III; CRE, cAMP-responsive element; CREB, CRE binding protein; ICER, inducible cAMP early repressor; IVGF, in vivo genomic footprint; mut, mutant; PKA, protein kinase A; RFX, regulatory factor X; UTR, untranslated region; wt, wild type. CBP, CREB-binding protein; IRF, IFN regulatory factor, CREM, cAMP-responsive element modulator; GAS, IFN-γ-activated site.